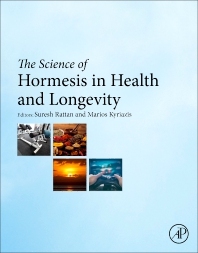 The Science of Hormesis in Health and Longevity provides a comprehensive review of mild stress-induced physiological hormesis and its role in the maintenance and promotion of health. Coverage includes the underlying mechanisms of hormesis, including details of stress-response signaling, an enriched environment, positive challenges and dose-response mechanisms, amongst others. Research from top experts is presented to provide suggestions for developing novel therapeutic strategies, along with lifestyle interventions to promote health and homoeostasis. Researchers in aging and physiology, gerontologists, clinicians and medical students will find this a valuable addition for their work. Dr. Kyriazi is a medical doctor (MD) from the University of Rome, Italy, and after preclinical work in the USA, worked as a clinician in acute medicine in Cyprus, and the UK. He subsequently qualified as a Gerontologist with interest in the biology of ageing and became a Chartered Member of the academic organisation ‘Royal Society of Biology’ in the UK. He also has a post-graduate qualification in Geriatric Medicine from the Royal College of Physicians of London. Other appointments include Member of the Board of Trustees at the Mediterranean Graduate School of Applied Social Cognition, affiliate researcher at the Evolution, Complexity and Cognition Group, University of Brussels, and a Ronin Research Scholar. He co-organises the Cyprus Symposium on ‘Pathways to Indefinite Lifespans’. He is a member of several editorial boards. He is also a Member of the International Committee, Journal of the Spanish Society of Anti-ageing Medicine (SEMAL), Board Member (Directors) of the European Society of Anti-Ageing Medicine (ESAAM), a Peer-review Board Member, Anti-Ageing Conference London, among others. He portfolio comprises over 1000 articles, papers and lectures in the field of healthy ageing. Currently, he works with the ELPIs Foundation for Indefinite Lifespans to study the elimination of age-related degeneration. The research is focused on transdisciplinary models and explores common principles between biology, complexity sciences, evolution, cybernetics, neurosciences, and techno-cultural elements.